The report will evaluate the supply chain management strategy that was applied in the manufacture and distribution of Boeing’s 787 Dreamliner with respect to its initial supply chain management strategy that had been used over the years to manufacture the other types of aircrafts with specific reference to Boeing’s 737 aircraft. The main objective of the report is to determine the feasibility as well as the success rate of the new supply chain management strategy that was used by the company. However, the report will also seek to identify the challenges as well as the risks that the company was exposed to with the new supply chain system that had not been tested or used in the history of this industry. The report is structured in a simple manner that begins by briefly describing the supply chain and logistics management recently embraced by the company in the manufacture of the 787 Dreamliner, showing how its integrated system, the Collaboration Hub helped the company to increase its competitive advantage, explore the importance of customer expectations and the risks of on-time delivery of the aircraft, discuss the effect of controlling technologies on the supply chain management of the company, explore the implication of Boeing’s aircraft manufacturing activities on the environment and the remedial steps that the company has taken to reduce the impact on the environment and finally the report will give its conclusion and recommendations on the supply chain management system adopted by the company. For the Boeing Company to run the above operations effectively, the company has put in place a formidable supply chain management that can be described as complex due to the numerous international companies under its supply chain. From the last decade, Boeing has been focusing on lean supply chain management practices. Over this period, the company has been focusing on cost reduction and lead time savings through improvements in its existing processes and adoption of modern technology. The company has internally focused on process improvements more especially in assembly operations and linked them top other external process reviews to ensure that they are complementary to each other enabling the company to reap maximum benefits. Boeing made a decision to manufacture its 787 Dreamliner using an unconventional supply chain to the aircraft manufacturing industry. This unconventional supply chain has a vision of cutting on the manufacturing and assembling costs while spreading the financial risk involved in the development of the aircraft to its suppliers who were turned to be strategic partners (Tang & Zimmerman, 2009). 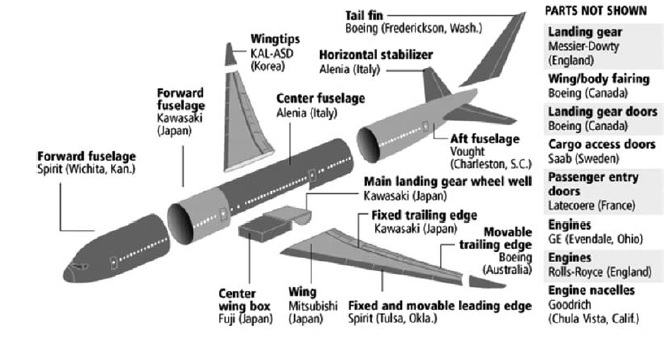 Unlike the traditional supply chain where Boeing played a critical role in the manufacture and assembly of the 737 whose parts and subsystems were produced t though thousands of suppliers (figure 1). The 787 supply chain, which is the current supply chain being used by the Boeing company is based on a tiered structure which enables Boeing to partner with close to 50 tier 1 strategic partners. The strategic partners assemble different parts produced by tier 2 suppliers (figure 2). 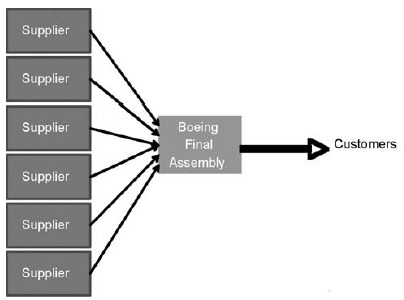 Under the 787 dreamliner supplier system, the tier 1 strategic partners are responsible for the manufacture and delivery of complete parts and subsystems to Boeing allowing Boeing to only assemble the complete sections at its assembling plant in Everett, Washington (figure 3). The rationale for the differences in strategy to supply chain shown in table 1 above can be traced to the following factors. Boeing’s assembly plant. This is meant to reduce lead time as well as development costs. The coordination and collaboration in this supply chain is achieved through the collaboration hub which was developed by Exostar to improve visibility, achieve control and integration of key business processes (Sanders, 2009). Boeing fostered partnerships with its approximately 50 tier-1 suppliers by empowering them to build the entire sections of the aircraft as it focuses more on the pre-integration stages as opposed to raw procurement and subassembly. However, this should be carried out with extreme care because of the supply risks and reduce the bargaining power of the manufacturer (Tang, 1999). By shifting more to the strategic partners, the company can save on costs and development time. The new risk-sharing contract between Boeing and its strategic partners’ states that none of the strategic partners can receive payments until the complete aircraft is commissioned for flight and is delivered and accepted by the customer. This shifts the financial risk of missed delivery to the financial partners as opposed to Boeing itself even though it is the one responsible for ultimate delivery to the customer (Tang & Zimmerman, 2009). By decentralizing the manufacturing activities Boeing is outsourcing non-critical processes, Boeing reduces the capital investment requirements that normally come up with increase in capacity (Tang & Zimmerman, 2009). The collaboration hub ensures on time delivery of finished aircrafts to the customer. On time delivery has been made possible through effective collaboration of the company with its partners in the supply chain that is run by the collaboration hub (Sodhi, 2009). The collaboration hub ensures continuity of supply and minimizes the supply disruptions which have been experienced in the supply chain previously. This is achieved through real time synchronization of demand with supply. The identified hiccups are addressed immediately to ensure that activities go on as planned. The collaboration hub has eliminated latency in communicating the demand and supply trends across the Boeing’s multiple tier networks with its partners all over the world. Effective communication of demand and supply enables timely action by the company leaving customers satisfied. The collaboration hub results to improved cash-flow by managing inventory levels in organizations that have partnered with Boeing to form its supply chain. An up to date, automated inventory system ensures that replenishments are made on time to avoid last minute rush that may lead o liquidity challenges. The collaboration hub is important in early detection of demand as well as supply imbalances and their anticipated impacts on other partners or aspects of the supply chain. This enables quick action to avert any impending crises and enable both the forward and reverse supply chain to continue as planned. The collaborative hub improves on time delivery to customers whiling minimizing on logistical costs. The hub reduces the lead time by real-time of communication of demand and supply and minimizes logistical costs through improved visibility in all tiers enabling processes to move from one stage to the other in a planned and organized manner to avoid incurring extra storage costs due to delays in some parts or components. The collaboration hub aids in reporting and analysis that is important in continuous process improvements over the life cycle of the programme being undertaken. The collaboration hub will minimize waste in the supply chain as it is based on digital platform that is effective in communicating the specifications and design requirement in a manner that is clear to everyone. The right, clear design requirements are important in coming up with parts and components with less incompatibility issues that lead to reworking which wares both time and resources ( Sodhi, 2009). The collaboration hub is a crucial step towards exception-based management of the end to end process across all Boeing partners and partner tiers as well. High customer expectations helped to pile more pressure on Boeing to deliver within the stipulated timelines. This pressure necessitated Boeing to come up with a raft of measures that were geared towards reducing the lead time. High customer expectations have helped Boeing to come up with innovative ways of manufacturing that ensures that product received has minimal impact to the environment like the 787 Dreamliner which has more capacity but emits less to the environment and has less noisy landings and take offs. Customer expectations have pushed the Boeing Company to review its processes and operations so as to align itself with the customer’s needs. The customers’ expectations on the787 Dreamliner led massive overhaul and integration of the Boeing Company with its suppliers. It changed the earlier arm’s length approach and resorted to have partnerships with its suppliers while encouraging them to come up with more valuable parts that reduce the assembling time and hence reduce the lead time ad enhance quick delivery to the customers. Composite fuselage safety issues, the composite material for the 787 Dreamliner had not been used before to this scale and the supplier partners initially spent time to figure out whether it was feasible. This caused the delays that were experienced (Wallace, 2006). Computer network security issues: the initial configuration of electronics puts the passenger electronic entertainment in one network with the flight control system. This raises security questions with regard to terrorist attacks (Zetter, 2008). Engine interchangeability issues, the 787 modular design concept allowed the airlines to use two different types of engines (from Rolls—Royce and GE) interchangeably. Due to technical difficulties the changing of the engines form one model to the other delayed (Leeham Co., 2005). Boeing relied on tier 1 global strategic partners to develop and build the entire sections of the 787 Dreamliner based on technology that had not yet been proved anywhere. Any delay in the supply chain could affect the whole manufacturing system. Even with the collaboration hub integrated system developed by Exostar, effective coordination was never achieved as different supplied did not enter accurate and timely information into this system leading to delays from other tiers making it difficult for Boeing to respond to the issues on a timely manner (Tang, 2007). The design of the 787 supply chain depends on the just-in-time deliveries by Boeing’s tier 1 strategic partner. A delay of one section in the supply chain delays the whole process. Boeing did not keep any safety stocks leaving it vulnerable to late delivery in case of a delay in any of its tier 1 strategic partners. Being has embraced a risk-sharing contract payment with its strategic partners, as per the provisions of this contract; none of the partners gets paid until the plane is certified for flight. Some strategic partners are slower than other and the arrangement seems to be punitive to the quick ones as they have to wait for others. This has been seen to act as a disincentive that undermines the original intent of the risk sharing (Kwon et al., 2009). Boeing used unconventional supply chain to develop and build its 787 Dreamliner as it did not include any leaders with proven supply chain management record who have sufficient expertise and experience to anticipate certain risks I the supply chain and develop contingency plans to mitigate the impacts. By embracing an unconventional supply chain management, Boeing took a huge managerial risk. As Boeing embarked in outsourcing most of its functions, its workers raise concerns about their job security leading to a strike by more than 25000 workers in September, 2008. On seeing this, Boeing’s strategic partners reducing their activity during this strike period as they anticipated that the strikes could led to order cancellations and delayed deliveries. This led to delay of fuselage parts for the 787 that delayed the completion and delivery of the jet to the customer (Rigby & Hepher , 2008). As Boeing experienced a series of delays, customer started to cast doubts in Boeing’s aircraft developing and building capability with growing concern that the first 787 Dreamliners were overweight by 2.2 metric tons leading a reduction of up to 15% in Range (Norris, 2009). Some customers began cancelling their orders and taking leasing arrangements instead of outright purchase. The Dreamliner orders had declined from 895 in November, 2008 to 850 in July, 2009 (Sanders, 2009). How the use of controlling technologies has affected Boeing’s manufacturing supply chain? Boeing contracted Exostar to develop a cloud-based system for managing the supply chain across it tiers as well as its strategic partners. The system, collaboration hub, powered by E2open software was developed to monitor various activities carried out by sub-contractors, increase the visibility in all its tiers, get real time control over demand and supply as well as other forward or reverse processes in a bid to achieve effective collaboration between all its establishments, tiers and strategic partners located in different parts of the world. These controlling technologies were just introduced with a raft of other measures including delegation of some responsibility to suppliers, who were turned into strategic partners. The system had not been tested before to determine its effectiveness and anticipate any risk and come up with mitigation contingency plans to remedy any impending problems. As a result, the employees in both the company and its strategic partners just started using the system. Workers in tier1 fed wrong and incorrect information into the system leading to delays from tier 1 strategic partners that leading to massive delays with all other sections in the supply chain as well as the distribution channel. The central single cloud based system has done tremendously well in achieving collaboration and coordination among the tiers as well as the strategic partners by ensuring visibility of the latest demand requirements as posted by Boeing, it has also helped Boeing to determine the strategic partner’s capacity the supply the required parts. However, it is important to note that despite the integrated collaboration hub doing much in bringing collaboration and coordination, the supply chain also embraced the just-in-time delivery by the strategic partners or tiers. Any delay in one of the tiers or strategic partners will lead to delays in the whole system, affecting the delivery of Boeing to its clients. This is what delayed the delivery of 787 Dreamliner as the delivery of the fuselage was delayed from the contracted strategic partner leading to cancellation of orders and loss of confidence among its potential customer alongside many other effects. Boeing has enhanced its processes and practices towards an environmentally friendly manufacture and transport of its finished jets to customers. Despite the industry being cited as one the high pollutants of the environment, Boeing has been scoring well in various reports measuring the impact of various activities carried out by the company to the environment as follows. Boeing like any other manufacture of aircraft uses materials that are hazardous to the environment, the use of halon for fire protection is harmful to the environment but the good news us that Boeing has indentified replacements for such material and they are currently under testing (Boeing, 2013). The manufacture of aircrafts leads to release of waste of material that is hazardous to the environment. Boeing has been addressing this through recycling. However, the last five years to the year 2012 saw a reduction of hazardous waste by 18% (Appendix 3). Aircraft manufacture is an exercise that requires use of a lot of water. If not managed well, excessive consumption of water can lead to depletion of water levels ad affect supply to other activities that are of ultimate importance to the human life. However, by 2012 Boeing recorded reduction in water use by 2% (Appendix 4). This is a significant figure given the large volumes of water involved in the aircraft manufacture process (Boeing, 2013). Aircraft manufacture is an energy intensive exercise that consumes a lot of energy. If not controlled the high demand for energy will cause more environmental degradation. However, Boeing as by the rear, 2007 had started reducing its energy consumption (Appendix 2). The overall aircraft manufacture process releases toxic substances to the environment that significantly contribute to environmental pollution. However, with the enhanced supply chain, Boeing encourages value of the parts and components by empowering the strategic partners to make complete parts so that Boeing only does minimum work by just assembling reducing the release of toxic substances to the environment. However, by 2007, Boeing reduced toxic releases by 1% while transfers of chemicals reduced by 885 over the same period (Boeing, 2013). Boeing works closely with its food and service providers to improve environmental conservation through clean energy use, reduced emissions and other measures that oversee the provision of healthier food to its employees as well as customers through means that cause less pollution to the environment (Sanders, 2009). However, it is important to note that meaningful progress in reducing environmental impacts in the aerospace industry requires cooperation among the aircraft manufacturers, suppliers, customers and regulators all over the world (Boeing, 2013). After exploring the new supply chain management system that was used in the manufacture of the 787 Dreamliner, the report has found the supply chain management system effective in the long run. Boeing is at the moment reaping benefits from this integrated system that has indeed helped the company reduce its costs, increase its capacity at no cost and reduce its lead time significantly making it possible to meet its customers’ demand on time. However, the report recommends that, the new system could have been implemented incrementally along with the existing system until its workability and sustainability is established to avoid exposing the company to the risk of logistical failure which has far more reaching implications ranging from financial losses, business lose, tainted image and possible litigation from aggrieved parties. The company could have involved experienced personnel in the supply chain management and this could have helped in anticipation of some of the challenges that caused a lot of delays in terms of supply from strategic partners which ultimately delayed delivery to the customers leading to lose of business among other effects. Blackhurst (2009), Managing supply chain risk and vulnerability: Tools and methods for supply chain decision makers. New York: Springer. Norris, G. (2009), 787s move along, weight problems persist, Aviation Daily.